I wanted to approach this album as objectively as possible. See, I’m that annoying Bob Dylophile. You know, the one who listens to, plays, reads, and talks about Dylan so much that everyone around him starts to loath Dylan because of it. Did you know Greil Marcus wrote a whole book about the song “Like a Rolling Stone?” Well, I did. I read it. Three times. I read a whole book written about one Dylan song three times. Next, I don’t hate Jakob Dylan. In fact, I forgive both him and his brother Jesse for their bad art because they’re Bob’s kids. (Jesse Dylan is a film director who directed How High, a stoner movie about dorky, white college kids meeting rappers Method Man and Redman.) That said, I’ve never really liked the Wallflowers. Sorry. I just can’t stand them. And I’ve always hated how they’ve had tons of radio-play just because (I thought) their super-model-version-of-his-dad-frontman has daddy’s coattails to ride in on. But…Rick Rubin decided to produce this album for a reason, I pondered, and if you can’t trust Rick Rubin’s taste, whose can you trust? We all know and love what he did with the later part of Johnny Cash’s career, and if you haven’t heard the stuff he’s done with Neil Diamond recently, hear it…So, I put the album on. Ladies and gents, we’ve got a decent album here. There is a certain cool that has recently been exploited by the John Mayer’s and Jack Johnson’s of the world, but its sources are legit. From the likes of modern West Coast troubadours Beck, Aimee Mann and Elliot Smith, back to Harry Nilsson in his LA days, and on back to Mr. Mississippi John Hurt himself, there is a mellow, groove thing that (for a reason you can’t put a pin on) is not corny. And that’s the thing that Jakob and Rick get here. In a quick 38 minutes, they get out 10 mellow, country/folk songs that are good for a Friday’s back-porch, if but just a little unimaginative. Jakob’s voice is not really beautiful, nor is it all too interesting like his dad’s. But it’s cool and calm enough to be enjoyable, and I’d be quick to bet Bob wishes his own voice sounded as good as his son’s at this point. The music never gets too indulgent, jazzy, or jammy; it’s reminiscent of Billy Bragg & Wilco’s Mermaid Avenue albums, alt-country-pop-candy interpretations of lost Woody Guthrie writings (writings that Guthrie’s wife first offered to Bob Dylan, but after a fruitless trek through freezing mud, Dylan gave up acquiring). And Seeing Things never reaches too far for esotery, leaving the moments of beauty that surface to speak for themselves. Some of these include: “Evil Is Alive And Well,” an eerie, subdued folk-song you can imagine being performed on a black spotlit stage on an early sixties television program; “All Day And All Night,” where Jakob states “my line of work suits me fine,” and though you might think that it wouldn’t be his line if nepotism weren’t in play, you believe him anyway; “Will It Grow,” an amazing cinematic western song ala Bob’s “Days of ‘49” or the entire soundtrack to Sam Peckinpah’s Pat Garrett & Billy the Kid; and “On Up The Mountain,” in which he wails, “you get tired, you get weak but you won’t abandon a masterpiece,” and you can’t help but sympathize with him knowing how much fathering must have been sacrificed in his upbringing for his father to be the legendary masterpiece-maker he was from the moment Jakob entered this world. After spending half a career distancing himself from his father, it seems as if Jakob has finally realized his father’s formula might not be too bad: just play what the Holy Spirit puts in you. (I imagine the Holy Spirit looks and acts a whole lot like Rick Rubin.) And hell, every one of Jakob’s contemporaries has already ripped the style of his father’s songwriting off (at this point, it’s arguable that it’s impossible not to); if anyone’s entitled to doing a ‘Dylan-thing,’ it’s the blood heir himself. In many family businesses, there is a self-discovery period that the son must go through before he’s ready for the family secret. Seeing Things shows that Jakob Dylan’s been given the secret, and even if he’s not gonna be in as boomin’a’ business as his father was, he’ll keep the doors to the family biz open cause his line of work suits him just fine. I am one the Bob Dylan fans who read everything for over 20 years now. I LOVE Bob Dylan. And I like his kids. What I know about them; all of them. I liked your review, I think it’s objective; you are objective where I can’t be. I also love The Wallflowers. And I like the videos Jesse Dylan directed – Music Videos. Very nice review. I wouldn’t have given “Seeing Things” a listen (for a lot of reasons) but now I’m on my way out to pick it up. I must say the “seeing things” review helped my music eye see things. Does he write anywhere else? Curiosity killed the ant, Corby. I have been waiting for another album/cd from Jakob since his last. I love him! I concur with the review. 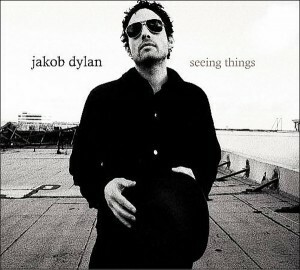 I love to see Jakob embracing his roots, and even though this album is slightly less melodic than his previous stuff- more of a Dylan cadence, I think it works well and he seems to have matured as an artist. You don’t like the Wallflowers because it was on the radio and his dad is Bob Dylan? Ok, so I overstated that a little bit. But the Wallflowers sure were good at what they did for a couple albums… not hard to imagine Jakob continuing to write well-crafted songs. I was twelve when the Wallflowers came out. Sure, I liked ’em fine then, dancing to them in the carpeted living room of my suburban home in front of an Mtv screen. But I can’t take ’em seriously when I listen to ’em as an adult, no. In that middle ground between having ‘poetic’ songs and pop sterility, they are Dylan without the anger that charged him, the Beatles without the imagination. Which basically makes them something like a soundtrack to a six-year-old’s TV program. For the sake of concise and fun argument, I was mainly trying to state that nobody’d know who the hell Jakob Dylan was (cause he wouldn’tve got radio play) if he didn’t have Bob as a dad. That said, with the release of this album, I think Jakob taps into something, a source that exists despite him or his father, a source that his father also once tapped into. And because he does so, I am happy that he has been able to use his father as a platform so that he could deliver these songs to us.